Real life global volunteering stories about volunteering abroad, volunteering internationally, notes from the field, lifelong friendships, reflections, and tales of how each person makes a world of difference. As the gate to SEAM Children's Home opened, I watched as ebullient children ran up to us, eager to meet the new team of three. Stephen, our team leader and host, introduced us to the children. The children had seen countless Global Volunteers pass through the gates of the home; even so, they ran to us, beaming with smiles. I pulled out my camera and watched as the children's attention rapidly shifted toward the device. They began to rattle off sentences in the local language of Tamil, an unfamiliar one to me. I was 14 and spending a month of my summer before sophomore year in India. The previous day, my dad and I had left the comforts of my grandparents' home in Bangalore, India, for a father-daughter bonding experience we had never had before. My dad had wanted me to realize that not everyone is alike with respect to economic background. I spent the weekdays in two locations. In the mornings I worked at Assisi Illam, a day care and orphanage, teaching the alphabet and basic numbers to children between the ages of two and five. Fortunately, the language barrier between the nuns in charge of the school and me did not prove much of a problem, although hand gestures came in handy most of the time. The afternoons, on the other hand, greatly tested my confidence as I was assigned to teach English grammar to four nuns-in-training. Ironically, the women addressed me as "maam" even though they were five to six years older than me. Although daunting at first, I gradually began to enjoy the role of a teacher as I organized lesson plans for my students every night. As a result of my experience in Chennai, I had the desire to revisit the following summer. Yet less than two months later, the demands of high school again became my topmost priority and center of focus. I remember my dad occasionally bringing up the country of Ecuador as the idea of summer vacation loomed overhead. Neither of us had been to South America before and my dad's final decision for us to volunteer there proved to be a second remarkable experience. Our experience in Ecuador, also with Global Volunteers, was quite different from that in India as our team consisted of 14 eclectic people. Spending two weeks in a day care center for young children, I rediscovered my passion for working with children. 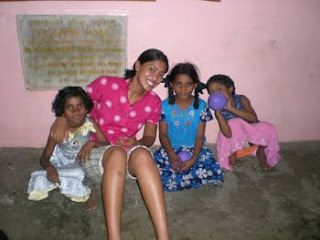 Like the kids in India, children came from impoverished families. I was also given a chance to experience Spanish culture at its best and immediately fell in love with the music, traditions and food. My most vivid memory is of Emilio, a three-year-old boy who rarely took the time to smile or even talk. After two weeks of joking and playing around with him, I noticed that he began to let out a few giggles towards the end of the two weeks. After saying my final goodbyes to Emilio and the rest of the children, Edith, our team leader, told me a heart breaking story about Emilio. Edith said his shyness was a result of a car crash his parents were involved in. His mother had rarely spoken to or smiled since his father had died in the crash. Upon hearing this, I felt so much better about my time spent with Emilio as it proved to be rewarding for both of us. Many people think of volunteering abroad as a life-changing experience. In my case, I realize that I have returned to my regular life. Yet there is no doubt that my two experiences abroad gave me personal insight that has made me more aware of my lifestyle as a blessed one. As a result, I discovered my passion for teaching and enjoyment of Latin American and Indian cultures. I realized that across the world we all hold common goals. Between the novices and the Ecuadorian children, I understood that though we differ in economic background, we all strive for a good lifestyle and education. Volunteering opened my eyes to this, and I hope to continue helping others while opening my eyes to the reality we miss each day at home in Palo Alto.